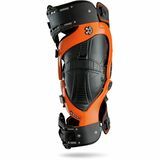 Korky - Las VegasV Asterisk - Much Improved "Very happy with my Asterisk knee braces. Had a pair years ago and even though I was happy with them the new version with boa knobs is awesome. Only minor complaint is that my pants tend to get hung up on the braces when I'm putting pants on or taking them off." Davis851 - Sacramento They have made them even better! "Bought the pair to replace my 4 year old pair that had a lot of use. The new ratchet tensioners are really really good for getting the braces nice and snug. I was very impressed after using them several times."